… to do the right thing for the environment. That’s why we have started hosting our own GREEN MONTH at Victoria Transmission and Auto Care. We want to remind the community to do the right thing for the environment year-round, as we commit to so. We turn our website, social media pages, office and even staff GREEN for the entire month, in support of this initiative. As always, with every Green Service purchased, we make a donation to the Sierra Club BC in support of environmental preservation. And for GREEN MONTH only, all customers purchasing a Green package have the opportunity to spin the prize wheel for an instant prize – including additional eco-driving posters, Sierra Club BC donations, loyalty program dollar credits, and more! Thanks to everyone for your support, and we encourage you to continue your Green commitment, year-round. Contact us if you have any questions about the Green options we are proud to offer. 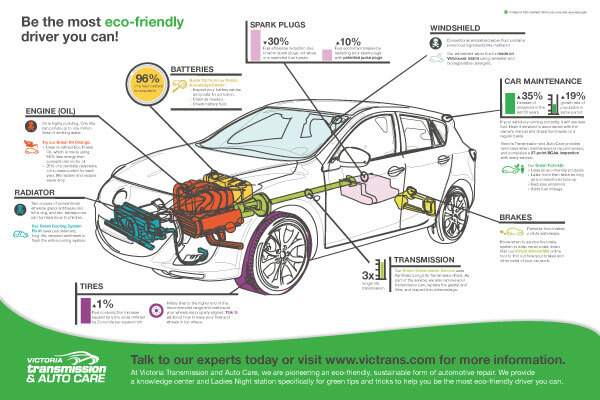 Check out the Infographic Poster we made specially for Green Month, highlighting eco-driving tips and tricks. To see the larger version, click on the poster.